This linen bigshirt is a great outerwear you can take with you on your vacation, combine it with solidcolor trousers and top and you will have chic and comfy casual outfit. This pair of extend tab stretch twill trousers by Alloy comes in sizes from 1 to 25 with inseams 30″, 32″, 35″, and 37″. 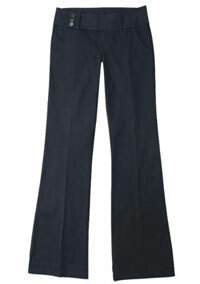 STRETCH twill mid-rise trouser with three-button extend-tab closure and back slit pockets. The trouser is made of cotton/ elastan blend twill material which hangs well, washes nicely and needs ironing after that. Pants are casual, weat them to school or the office.